How's it going? You doing okay? I am sorry to be away so long. We spent five amazing days with the grandtwins (photos below) and I planned to be back right after that except that a Migraine Train came roaring through here and knocked me for a loop for the last two days. I'm praying it's gone now for a long time, but if not, I appreciate the reprieve! So does Hammy. He's tired of trying to keep a cool cloth on my forehead while I'm rolling around moaning like a pig in a cactus patch. I followed Bev's lead and used the floral inspiration. The NBUS blossoms came from the MFT stamp and die set, "Large Desert Bouquet." I cut them from a Brusho background I made. The stamps are solid and I didn't want to cover up all the background so I very lightly stamped them and then ran around the edge of each petal with my mint green Ziggie. It was a bit fussy to do, but I like the definition it gave the petals. The NBUS sediment is from Concord & 9th's set, "You're My Person." A Washi tape border and some triple red blingaling completed the ensemble. 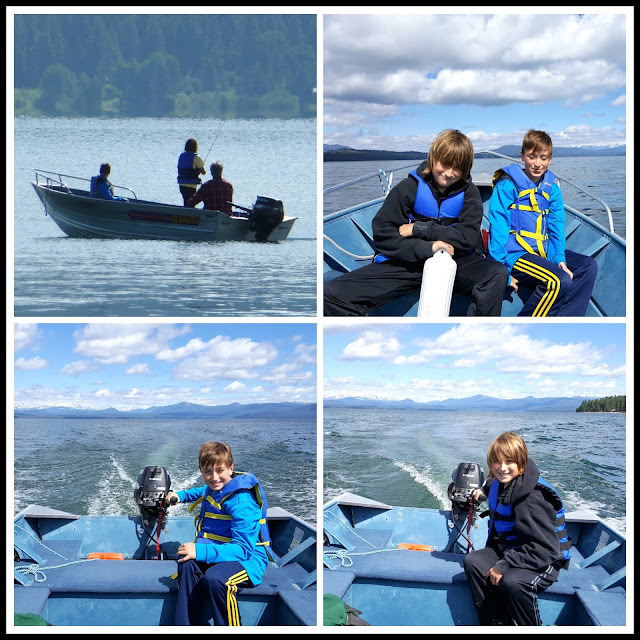 Papa and I took these two handsome and interesting 12-year-old characters away for five days to a lake near Mt. Lassen in northern California while their mom and dad had a nice long weekend in New Orleans. Henry on the left, Adam on the right. Short sleeves in the snow? Why not? Shoes untied? Well, of course! The first photo in the above collage is the view of the lake from the deck of the house we rented. 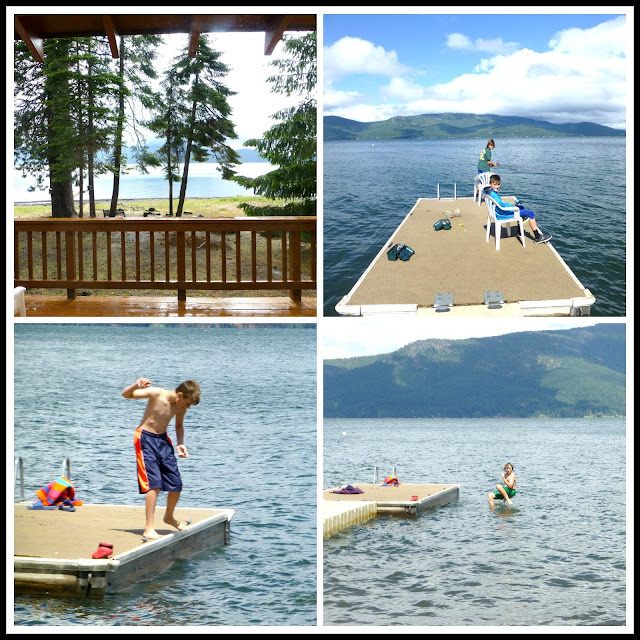 There was a small private dock for the boys to fish and swim from. It was a boys' paradise and we loved it, too. A day trip to Mt. Lassen was foiled by a road closure due to the heavy snowfall this year, but it was open far enough up to play for a while. Papa rented a fishing boat, but try as they might both on the dock and on the boat, their faces in the upper right photo tell the story: NO FISH anywhere! Hecka fun driving the boat though! Tired of drowning worms? No problem, how about a trainyard and museum? We camped on this same lake and took their father to this same railroad museum 30 years ago, so it was really special to bring his sons to the same places! Thanks for letting me share our great times with you! Beautiful pictures Darnell, and I hope your migraine is all gone by the window soon. It's hard to focus with a headache. You have made a gorgeous green card for the challenge, love it! What a fun trip you had, sorry it all ended in a migraine. Hope you are fully better now. Your card is stunning with that vibrant green, really eye catching. Hi Darnell, Loving the card. I like the zingy (is that a word?) Green. Looks like you and the boys had a lovely time and what a beautiful place. Loving your card, Darnell, fabulous choice of colour and what great vacation pix - looks like a fabulous time will have been had by all - hope that migraine if off for good! 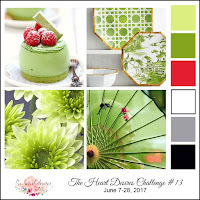 beautiful photographs and I love your pretty card :) green is one of my favorite colors! Love your stunning card Darnell - the vibrant green is wonderful. What a great holiday you must have had with the grandsons. Im sure you all had wonderful time togheter! I do hope you are feeling better Darnell... Wonderful CAS card! Love the bright greens with those red dots... I sure enjoyed seeing your photos... What handsome young boys and what super places you got to see! Have a good day! I'm sorry your trip ended with a migraine that laid you low. 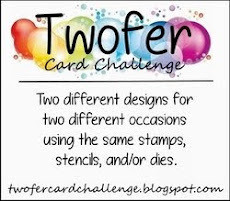 The card is in beautiful shades of green and a fun design on the left. What great pictures of the twins. That is such a beautiful place where you stayed with a stunning view. That was a true boy vacation of fishing and getting to drive the train. The snow got me - so much of it and it is so terribly hot here! Glad you had such a wonderful time on your vacay with the twins. Love the photos you shared. Sorry you had a migraine but hope it is all gone by the wayside now. 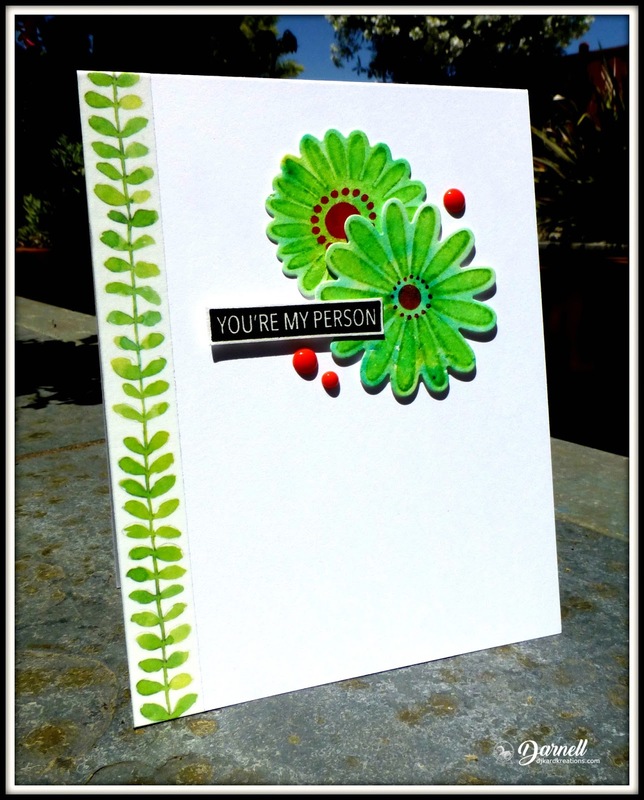 Love your pretty card with the green flowers. I am trying to picture a pig wallowing in a cactus patch now! Hope you are better for a long while. 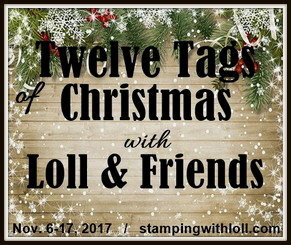 Your trip looked like tons of fun and your card is super bright and fun, too! Gorgeous card!! Hope you are feeling better! Looks like the grandkids had a great time. Hope their parents had a good time in New Orleans and hope they had some nice days without all of the rain we have been having here in New Orleans. Was doing prayer time so popped over to let you know am praying for 20th. Love your card wouldn't have thought of tine on tone with Brusho like that, brilliant..l love the boys shots too, what fun you all had!! So glad!! But sorry indeed for migraine train, my sister's get them too... mercifully it's one thing I don't get, I get bad heads and have to go to bed but not real migraines. what a very super card and such a super design. As usual it's perfectly created. Super photos of your Grandsons and your days away. So sorry to hear about your migraines my hubby suffers with them and they make him feel very tired the day after he has had one, and quite confused also. He used to get lots of them at one time but after his op for a blocked artery in his neck he doesn't suffer so much now. Love and big crafty hugs from my house to yours.Jenny L.
Hope the migraine is long gone. I was delighted to see the Mt. 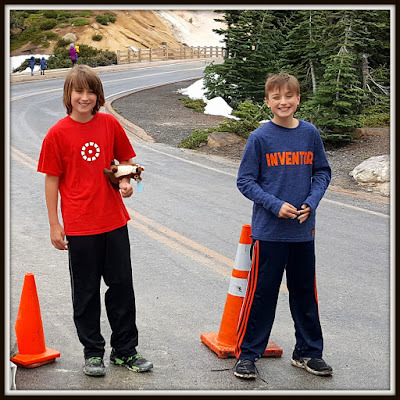 Lassen photos. We were there in August nearly 20 years ago when our kids were teenagers. It was 114° in Reading, and 90° at the top of Mt. 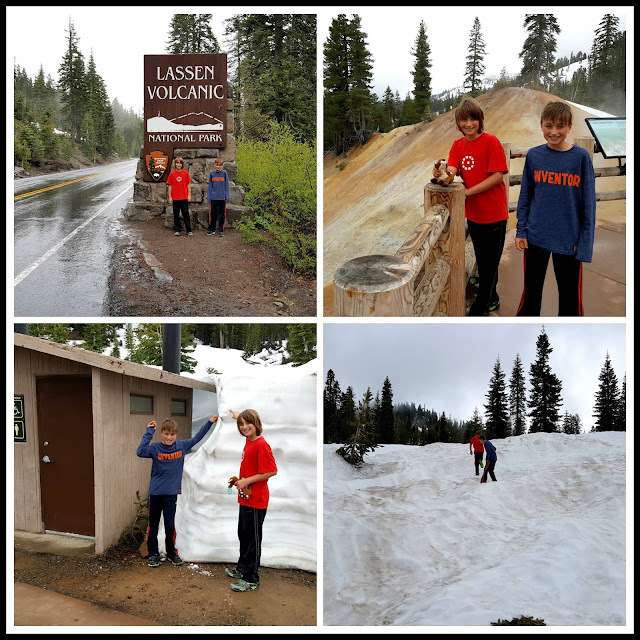 Lassen, but I have a photo of the kids in tank tops and shorts standing on a bank of snow. Love the pretty card! "A pig in a cactus patch"??? That's a new one on me but it's very descriptive. Yikes. Glad Hammy was there to bring you comfort. How fresh you card looks...love the sentiment and that awesome washi...you even got to use up some of your Brusho'd paper. Win-win. Looks like the boys had a blast despite the road closure and the lack of fish. It's amazing how they can always come up with something to do if they try. And how nostalgic and touching to share something with them that you did with their Father at the same age. Brought a tear to my eye. Well, I'll wipe my nose and end this comment. Hope you're feeling well and no more migraines. Hugs. Gorgeous flowers on your card. Thanks for sharing the pics of your outing with the grands. Looks like a fun time making precious memories. Amazing CAS, love the design and the bright colours! That green is fabulous! Your card is stunning. So sorry to hear that you've been plagued my migraines. My Mum used to suffer terribly with them, though she's not had one for a few years now, but I remember her having to stay quiet in a darkened room for a few days and taking in Farley's baby rusks in hot milk as that was the only thing she could keep down, so you have my complete sympathy. So glad that you were able to have a lovely vacation though, they will treasure those memories for years, as of course will you! 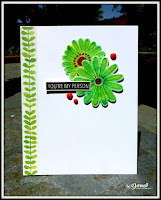 Beautiful card with those spring green blooms on it and it looks like everyone was having fun with the vacation too! Awesome card love how u used the colors, and the ink powders for your flowers. Looks like good times for you and the kids thanks for joining in JUGS! Oh poor you Darnell, migraines are so delibitating, awful things. Hope you are well and truly over it now. Your card is beautiful, lovely simple designs and colours. Great card Darnell. It captures the inspiration photo perfectly. Your trip looks fabulous. Swimming and playing in the snow all on the same trip. Gotta love global warming! 😂 Sorry to hear you suffer from migraines. Hope they are gone now. I'm sorry to read about your migraine. I know from experience how you have felt. :-( I hope it is away for ever! Thank you for sharing super nice fotos from your spring vacation. Oh, I almost forgot to write how much I like your card. It is so "fresh" in green. Amazing work and a great idea! Sorry you've had to put up with a migraine after your wonderful trip. Love your fresh and zingy looking card. It has a delightfully summery feel. Hope you manage to shake off the migraine and have some chill time over the next few days. First, I am so sorry you have been suffering with migraine, I hope that it stays away now for a very long time!!! Your card is beautiful, I love the green flowers, we used to have similar ones in our garden. The leaves up the side are just perfect and I love that sentiment too! I also hope that your migraine doesn't return for a very long time too. Beautiful card Darnell! Glad you all had a great time. Fun post Darnell, love the pictures. Your card is so fresh, and pretty. A bright and happy card and a bright and happy vacation with those handsome grandsons! I really enjoyed reading about your trip with the grandkids; I'll bet it's something they'll retell to their own kids decades from now, and something they now have in common with their Dad. Thank you for sharing your pics of your time away. Such great grandparents to take the boys on a trip I'm sure they will remember the time. Sure hope that migraine is gone for good. You've done Bev proud, your card is delightful! 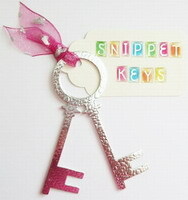 !, The Washi vine down the side is pretty. Terrific pictures of those handsome boys. Looks like they had a great time!! Your card is so pretty! Love that green flower. I need to remember that the next time I go to make a flower (I don't usually give green the time of day when it comes to flowers). 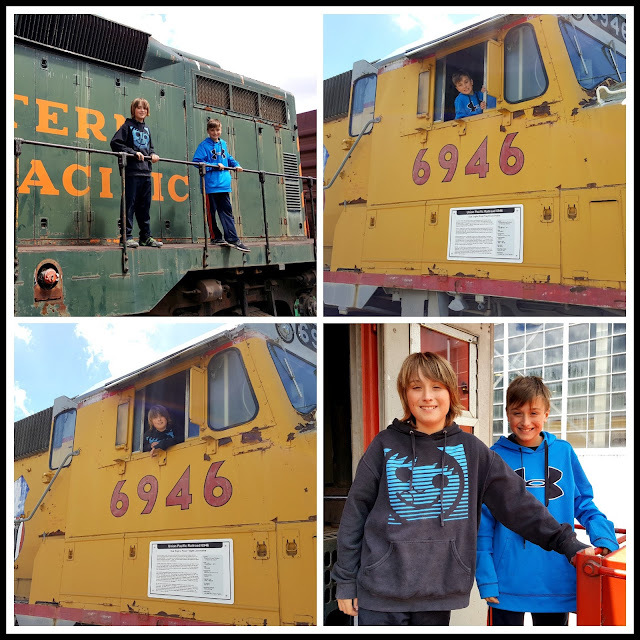 The big smiles on your grandsons' faces show how much they enjoyed their time with you. What a gorgeous place to make some special memories! Looks like you had an active vacation with two active boys!! Great collages/pics! And your card is beautiful; love the colours of the flower; those brusho-colours look so good! WOW! Looks like you all had an amazing time ..... it looks like a beautiful place. Gorgeous card too .... I love the bright colour. A lovely bright and fresh card Darnell and congratulations on being showcased over at Less is More. Enjoyed looking at your holiday photos. Beautiful card and pix, Darnell. I hope that migraine train stays away from your station! Fabulous card and it looks like you had a wonderful time with the grandtwins! Your bright greens really caught my eye and I love this card! Thanks for playing at CC&S. Fab pics of your grandboys too, they look like enormous fun! Lovely card Darnell and TFS pictures with the boys. Looks like you had a great time. Cool card. Love the leafy border. Thanks for playing along with us at CC&S! Wonderful card, thanks for joining us at CC&S. First of all I am so so sorry about the 2 day migraine not sure if I could live through more than one day! Glad you are feeling better! Oh my goodness looks like you and the twins had a wonderful time! Loved seeing all the photos and how big the boys are getting! We are Yosemite bound soon! Love your beautiful bright card, Darnell! Happy to have two of your cards on display in my craft room right now. Just need some time to get in that room. Hugs and miss you, sorry I am so bad at checking in. Hope you have recovered from your migraines by now....a delightful post, as usual. Those boys were in fro a real treat! So nice of you to let us in on the fun! Pretty card, too! Fabulous card...love the gorgeous gesso flowers! The outline really defines the petals beautifully! Pics steal the show though! Thanks for sharing your trip with us! So cool taking the kidlets to the same museum that their daddy visited 30 years ago! This is EXACTLY how new memories are made and old memories cherished! PS...you gotta bring the boys to Manitoba for some AWESOME, action packed walleye fishing!!! You're the best! Playing over at THD with Bev. And taking the twins to the same place their Dad vacationed. Such Fun!!! Love how they each sport a different look, BTW. Looks like everyone had a fantastic vacation. The boys are sure getting big. Time goes so fast, doesn't it??!! So nice that the boys get to go to the same place as you took there Dad. A special memory vacation for sure. Hope the migraines are getting better. Take care. What a wonderful trip with the boys, and looks like it included just about everything a 12 year grandson would want! Even better that you have memories of taking your son there years back...and that it's still standing! Your card is so fresh and pretty...and I love that bright green. With this hot weather we're having, a pop of bright color against white couldn't be more perfect. Hoping that your migraine is completely gone before your surgery..ugh. 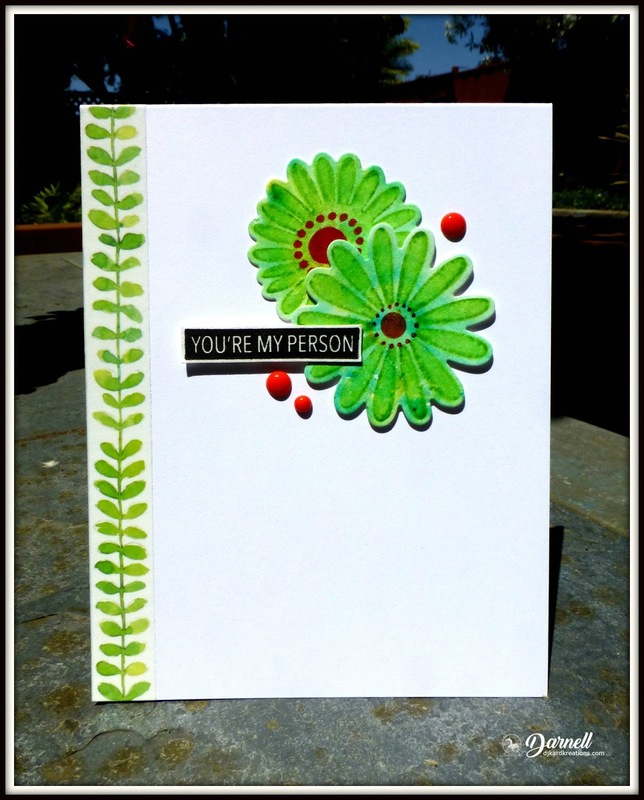 Very pretty card~that vibrant green color is a show stopper! 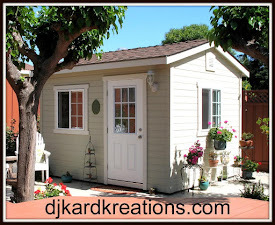 always a delight to read your fun posts and see your fab creations, Darnell! thanks for joining in again at THD--always welcome! I'm so jealous--looks like a wonderful place & a really special vacation with the twins! So sorry you ended up with migraines--hope they stay gone! 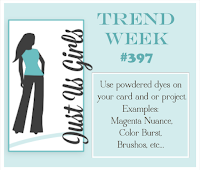 Your card is just brilliant--love the design & color! Of course short sleeves in the snow! My mom insisted I accompany her to return a VHS rental movie once. I had no shoes on since I was suffering a foot fungus. On the way home she detoured up the mountain to see the snow. And by see, I mean go frolic in it. So I joined her. It was brutally cold on my feet but it killed the foot fungus dead. So there! Anywho your vacation looks like it was a fun time. I like that you went from fun in the sun on the side of the lake (and on it) to snowfall over your heads. That's an all season vaykay if I ever heard of one. Your card is lovely too, btw. I bet those boys had so much fun with you guys! What great photos! You're card is beautiful...love the blooms! The washi trim is perfect! Thanks for joining us at The Heart Desires! I'm so glad the headaches stayed away from your vacation with the boys, it sure looked like fun! As someone that struggles with migraines I totally relate to your description of what I'm sure I sound like. Your card is beautiful! Please join us again at THD!